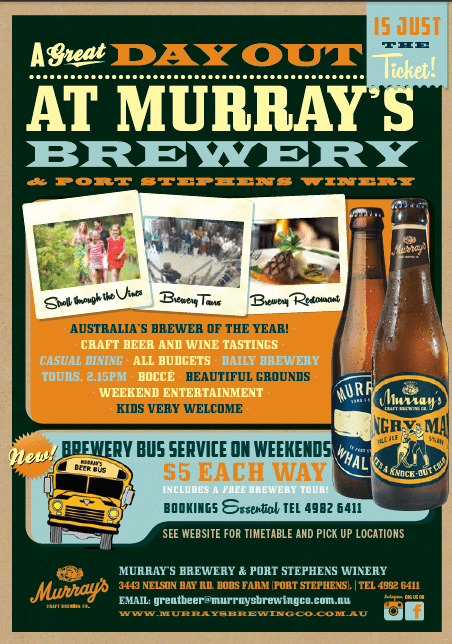 While staying at The Retreat Port Stephens on your family or group getaway, Murrays brewery Port Stephens, offers a brilliant bus service. Brilliant idea by Murrays brewery allowing everyone to enjoy the beverages and atmosphere that Murrays Brewery Port Stephens offers and no one needing to be the designated driver. While staying at The Retreat Port Stephens in our family or group accommodation options a lunch at Murrays brewery is highly recommended and this is the safest way to go to and from the property.